Although we have really enjoyed our time broadcasting Mind Power here in glorious Australia, Shane and I thought it was time for a change. 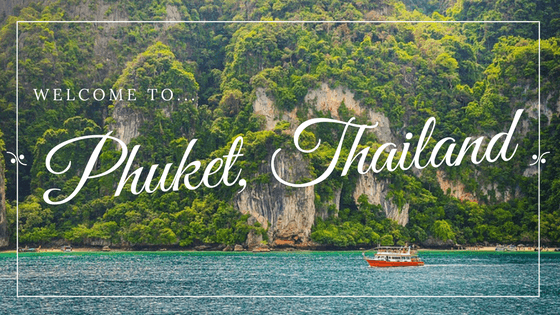 As we continue our travels around the world, our next stop leads us to Phuket, Thailand! This small, yet mountainous island off the coast of mainland Thailand is filled with rich rainforests and beautiful white-sand beaches with waters so clear that you can see the undersea life. We’re excited to share what we’ve discovered in our new home here on my blog! Located on the northwestern shores of Phuket sits Nai Yang Beach, a hidden beach that’s only a 10 minute drive from the Phuket International Airport. Since the beach is fairly secluded, the only way to access it is by staying at The Phuket Marriott Resort and Spa. However, your stay will be worth it because not only do you get the chance to soak up the sun on this private beach, but you can also take a free beginner yoga class on the shores! You will definitely feel relaxed and rejuvenated after spending a few days here. Part of what I love about travel is immersing myself in the different cultures and customs that are out there in the world. One of the most treasured landmarks on Phuket island is the Big Buddha, which a very prominent fixture on the island considering it’s size. With a total construction cost of 30 million, the Buddha stands 45 metres tall and can be seen from as far away as Phuket Town and Karon Beach on the opposite end of the island. 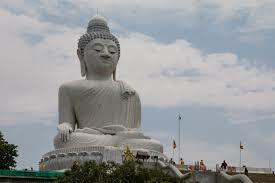 You can also visit Wat Chalong, which is one of Phuket’s most important temples. Decorated in thousands of pieces of shattered glass that glitter in the sun, this temple is a holy place for the locals to pray — so it’s best to learn about their culture before visiting. 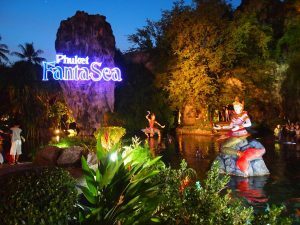 Check out FantaSea, which is a cultural theme park that will not only educate you and your family about Thailand’s traditions, but it will do it in an entertaining way. Trapeze artists, elephants, and phenomenal pyrotechnics dazzle the Palace of the Elephants Theatre stage in bright colors and sparkle. After the show, hit up the Golden Kinnare Buffet Restaurant, which seats you in a forest setting and has a plethora of traditional Thai foods prepared by the top chefs in the country. You can also try your hand at the carnival games and browse through the locally made silk, ceramics and jewelry in the 15 shops that line the Festival Village Shopping Street. 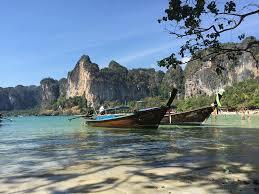 We’re definitely looking forward to our stay in Thailand! Stay tuned to both my blog and our podcast for new updates!